Live, game-by-game analysis of the Serena Williams vs Maria Sharapova final at the Miami Premier Mandatory event. 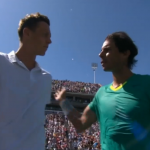 Our final impressions from Indian Wells. 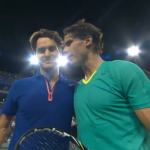 Live, game-by-game analysis of the Rafael Nadal vs Juan Martín del Potro Final at the 2013 Indian Wells Masters 1000. Picks for the finals in Indian Wells featuring Caroline Wozniacki vs. Maria Sharapova and Rafael Nadal vs. Juan Martin del Potro. Del Potro takes off a linesman’s sunglasses during his Indian Wells quarterfinal match against Andy Murray. A moonball rally from the Indian Wells semifinal between Caroline Wozniacki and Angelique Kerber. Live, game-by-game analysis of the Roger Federer vs. Rafael Nadal Quarterfinal match at the 2013 Indian Wells Masters 1000.